So here’s another musing I had on a beach visit. I don’t recall where I learned this trick, but I’ve had it for decades. 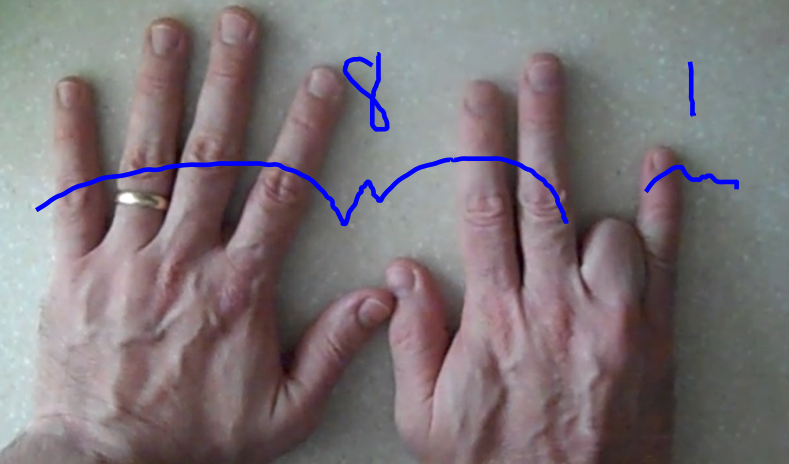 I suspect most of you already know how you can multiply by 9 using your fingers, but I’ll briefly explain just in case. An extension follows. Start by laying out both hands with all fingers outstretched. 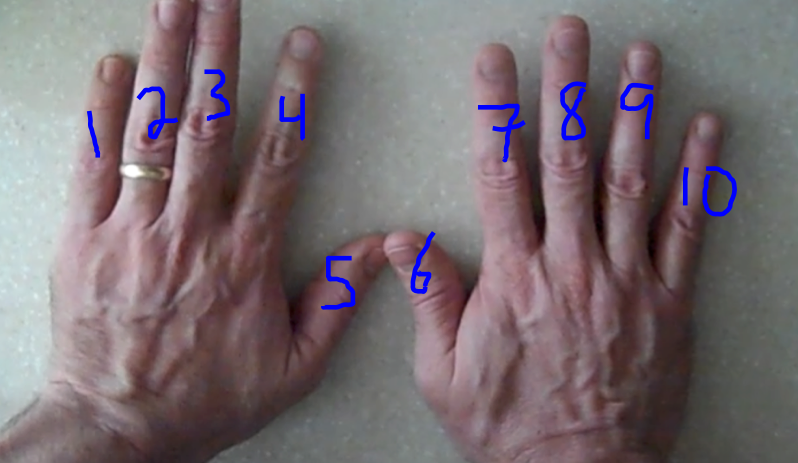 Number your fingers from 1 to 10 from left to right. 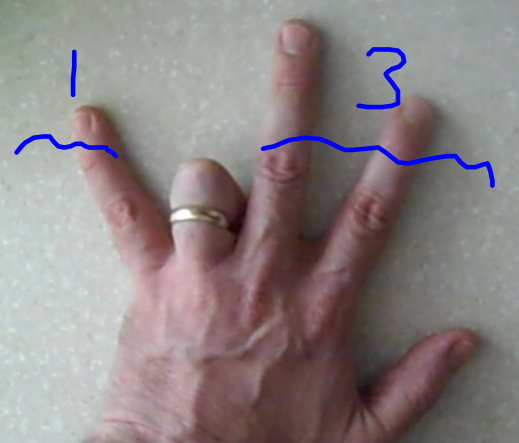 To compute for integer values of between 1 and 10, fold down the finger and count the number of still-extended fingers before and after the folded finger. Thinking of those two numbers as a two-digit number gives your answer. 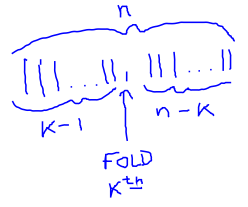 For example, to compute , fold down the finger as shown below. Because there are 8 fingers before the fold and 1 after, . Simple. On the beach, I recalled this little trick and first extended it to two other simple multiples of 9. 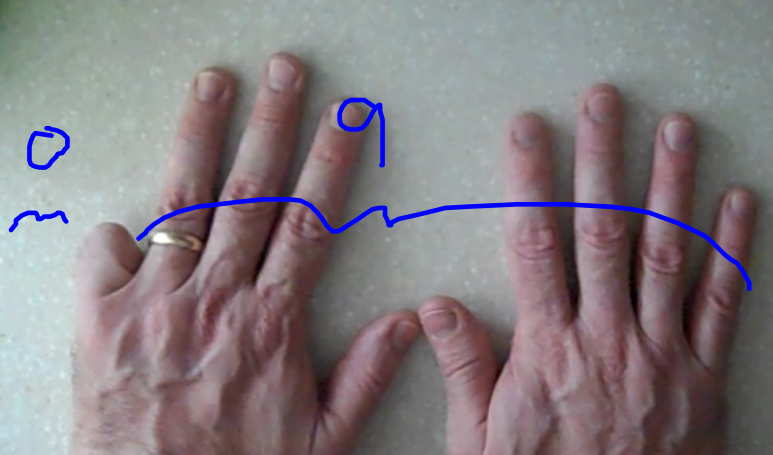 Computing is simple, but folding down the finger confirms the answer by showing 0 before and 9 fingers after the fold, so . Computing works the same way. Folding down the finger shows 9 before and 0 fingers after the fold, so . As I lay on the sand, I marveled at how nice this worked, but was saddened that such a cute approach had such limited applicability. Thinking about what was going on in this problem, the obvious observation was that all were products of 9 and worked from 10 initial fingers. So what would happen if you used a different number of fingers? 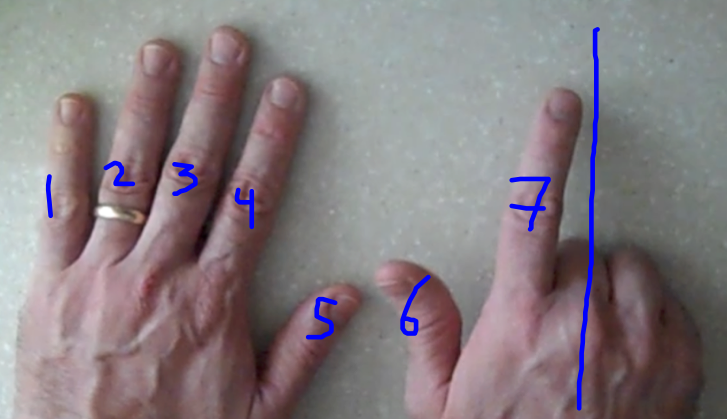 Starting with 7 fingers, numbered as before, I thought I might be able to multiply by 6. As a first attempt, I tried , but the next image shows that my approach gives –obviously not the correct result. Then inspiration struck. Perhaps the answer was good, but my interpretation was off. 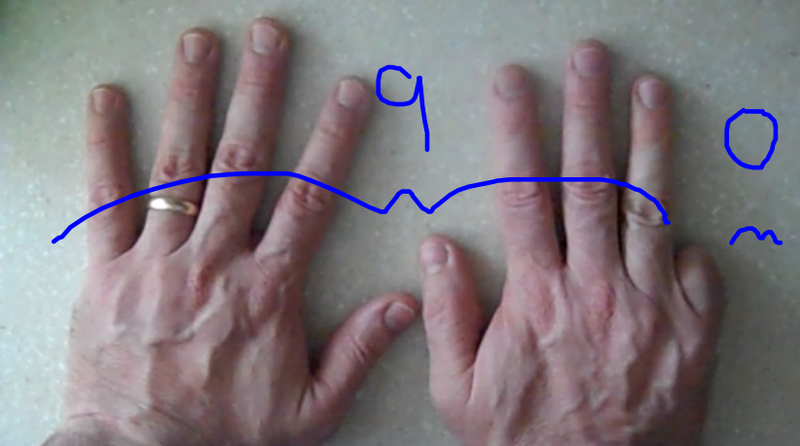 If multiplication by 9s (using 10 fingers) gave an answer in base-10, perhaps multiplication by 6s (using 7 fingers) needed to be interpreted in base-7. That is, . Eureka! But does it always work? 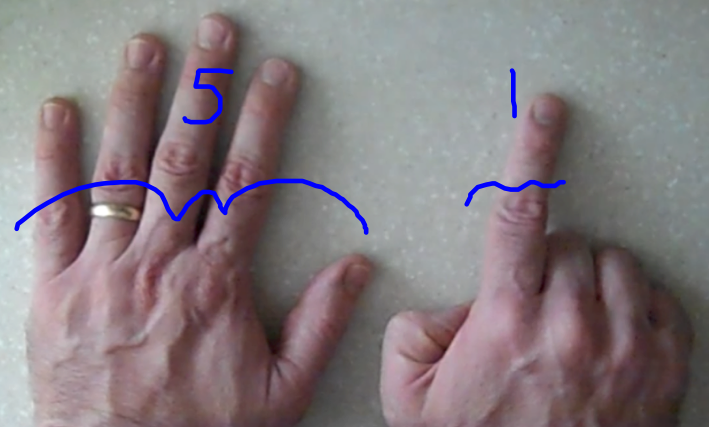 Testing once more, I tried using 5 fingers meaning I would be multiplying by one less (4) and getting an answer in the base of the number of fingers I was using. The next image shows . Generalizing, imagine that you could hold out any number of fingers. The image below suggests that you extended “digits”, so you could use this to multiply by . The next image supposes that you hold down the finger leaving fingers before and fingers after. So, if you just had enough “digits” (pun intended) and didn’t mind working in different number bases, the result of every single multiplication could be known with one simple finger fold! One of the terms in the expansion of is . If A, B, and n are all integers, what are their values? For me, the process is critically important. The answers don’t really matter; they just happen. I’ll post my students’ ideas in a few days, but for now I leave it open to any readers to leave their thoughts. This is a much cooler version of an idea I discussed in a series of conference presentations I gave back in 1997 based around my interpretation of a super-cool effect I had first noticed as a kid when I watched old Westerns. I still think it is cool when I see images of stage coaches and wagons racing across the prairie in one direction when their wheels appear to spin in exactly the wrong direction. To show just how geeky I am, I was sitting on the beach back in the summer of 1997 digging my toes into the sand of Atlantic Beach, NC thinking about cool physical phenomena and some random math problems when I grasped the reason for the “backwards wheels” and also realized that I could model that behavior on my TI graphing calculators. As with all good problem solutions, my analysis also led me to see that there were multiple speeds at which this backwards effect (I now know it is called a stroboscopic effect) happens, as well as an infinite number of speeds when the wheels will look like they are slowly spinning forward and between each of these effects, moments when the wheels appear to be motionless even though they are clearly spinning (as in the helicopter clip above). As a kid, I had been enamored with the backwards wheels, but after my fun on the beach, I began to look for (and see!) the whole range of effects on virtually every car commercial and movie with a vehicle in a chase scene. This next video clip isn’t anywhere near as cool as the helicopter above, but it combines all of the wheel effects I first explored in the late 90s. After my 2-day conference with Dan Meyer last week, I’m tempted to return to the scene of this new problem and add new hooks (perhaps the helicopter video above) to create new models explaining this stroboscopic effect. A future (hopefully soon) post will offer further insights. Until then, I’d love to know your thoughts and comments. About 10 years ago, I was introducing a lesson on series in a calculus class. This course was the first for which I had a Computer Algebra System (CAS, in this case, a TI-89) in the hands of every student. I’ve learned that “off task” who are still engaged in the class are typically the most creative sources of ideas. 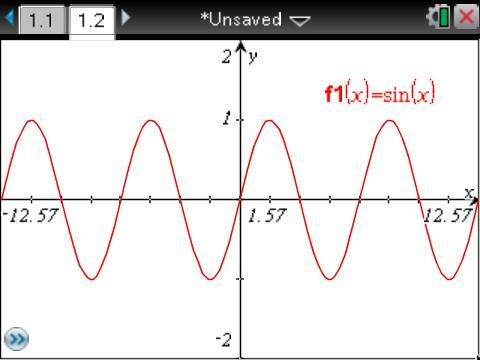 In this case, I was using the CAS as a support and verification tool on a lesson reviewing geometric series and introducing the harmonic series. At the end of class, a student approached me with his CAS in hand and an intensely puzzled look on his face. He asked, “How did this happen?” and showed me his calculator screen. Note the power of the CAS in this instance to handle way more math than the student understood, but it definitely piqued his interest and mine with its handling of an infinite bound, and especially for they completely unexpected appearance of . What in the world was going on here? Surely there must be some error. If you don’t have the stomach or time or inclination to consume the proof that follows, please scroll to the last few paragraphs of this post for my general comments on the reach of this problem. Spoiler Alert: If you want to explore why the series sum my student re-discovered is true, stop reading now! The following proof may not be absolutely water-tight, but it is how I’ve come to understand Euler’s stunning solution. The connection I missed for two years was that this is just a polynomial, and polynomials can be factored. OK, sine’s not really a polynomial, but if you can approximate it as an expanded polynomial (the Maclaurin series above), why can’t you do the same in factored form? So, the x-intercepts of sine are and by the typical manner of writing factored polynomials today, one would write But polynomial factors can also be written in the slightly more complicated form, , which actually ends of simplifying this problem significantly. The coefficient A allows the factor (product) series to vertically stretch to fit any curve with the given roots. Notice, too, that the equidistant terms on either side of the x term are conjugates, so the series can be further rewritten as an infinite product of differences of squares. a pretty amazing equivalence in its own right. Whenever two polynomials are equivalent, their coefficients must be equal when the polynomials are written in the same form. To explore this, you can expand the product form. Notice that the Maclaurin polynomial doesn’t have a constant term, and neither does the factored term because any combination of terms from the product eventually must multiply by the Ax term. Continuing this reasoning, the only way to get a linear term is to take the Ax term and then multiply by the 1 from every single binomial factor. Anything else would yield a term with degree higher than 1. Equating the linear terms from the product expansion (Ax) and the Maclaurin series (x) proves that A=1. 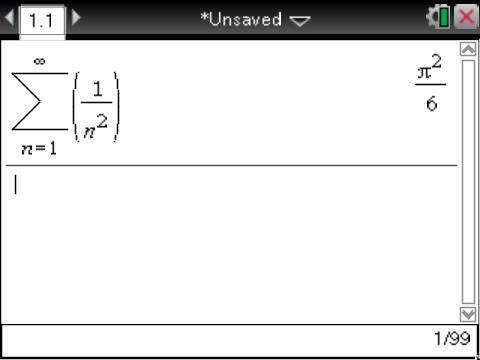 Factoring out allows the coefficients to compared and a minor re-arrangement from there proves my student’s result. I’ve always been blown away by how quickly this proof collapses from very cumbersome equations into such a beautiful result. It also amazes me that while a sine function was used to leverage the proof, the final result conveys nothing of its presence. Equating higher order terms from the two series allows you to compute the value of for any even values of k, but odd powers of k greater than 1 are still an outstanding problem in mathematics. We know they converge; we simply don’t have closed form values for their sums. Anyone up for the challenge? This is some pretty heady stuff for a student who just wanted to know what happened if you tweaked an expression a little bit. But then, isn’t that how all good math starts? My only regret is that the student who initially posed the problem graduated high school before we could find the answer to his question. The positive side is that hundreds of my students since then have been able to see this gorgeous connection. I hope all my students know that I value their questions (no matter how shallow, deep, or off-topic) and that I learn more and become a better teacher with every new perspective they share. Post-scripts (9/5/11) from communications with David Doster: I knew that I was walking in the footsteps of others as I created the proof above on my own, but a serendipitous communication with a colleague I met at a 1993 Woodrow Wilson institute on the Mathematics of Change. David pointed me toward Robin Chapman’s Home Page which includes 14 different proofs of this result–Euler’s (and my) proof is the 7th in that list. This result has also been a favorite of William Dunham as published in his books Journey Through Genius and Euler, The Master of Us All, both definitely worth reading. Thanks, again to Dave Gale‘s inspirations and comments on my initial post. For some initial clarifications, what I was asking in Question 3 was whether these square areas ultimately can all be found after a certain undetermined point, thereby creating a largest area that could not be drawn on a square grid. I’m now convinced that the answer to this is a resounding NO–there is no area after which all integral square areas can be constructed using square grid paper. This is because there is no largest un-constructable area (proof below). This opens a new question. Is there some type of 2-dimensional grid paper which does allow the construction of all square areas? Dave’s proposition above about determining whether an area 112 (or any other) can be made is very interesting. (BTW, 112 cannot be made.) I don’t have any thoughts at present about how to approach the feasibility of a random area. As a result of my searches, I still suspect (but haven’t proven) that non-perfect square multiples of 3 that aren’t multiples of pre-existing squares seem to be completely absent. This feels like a number theory question … not my area of expertise. Whether or not you decide to read the following proof for why there are an infinite number of impossible-to-draw square areas using square grids, I think one more very interesting question is now raised. My proof does not feel the most elegant to me. But I do like how it proves the infinite nature of these numbers without ever looking at the numbers themselves. It works by showing that there are far more integers than there are ways to arrange them on a square grid, basically establishing that there is simply not enough room for all of the integers forcing some to be impossible. I don’t know the formal mathematics name for this principle, but I think of it as a reverse Pigeonhole Principle. Rather than having more pigeons than holes (guaranteeing duplication), in this case, the number of holes (numbers available to be found) grows faster than the number of pigeons (the areas of squares that can actually be determined on a square grid), guaranteeing that there will always be open holes (areas of squares that cannot be determined on using a square grid). This exploration and proof far exceeds most (all?) textbooks, but the individual steps require nothing more than the ability to write an equation for an exponential function and find the sum a finite arithmetic sequence. The mathematics used here is clearly within the realm of what high school students CAN do. So will we allow them to explore, discover, and prove mathematics outside our formal curricula? I’m not saying that students should do THIS problem (although they should be encouraged in this direction if interested), but they must be encouraged to do something real to them. Now on to a proof for why there must be an infinite number of impossible-to-draw square areas on a square grid. This chart shows all possible areas that can be formed on a square grid. The level 0 squares are the horizontal squares discussed earlier. It is lower left-upper right symmetric (as noted on Dave’s ‘blog), so only the upper triangle is shown. From this, the following can be counted. The percentage of possible numbers appears to be declining and is always less than the possible number of areas. But a scant handful of data points does not always definitively describe a pattern. Level 1 has 9 single-digit areas. Level 2 has 90 two-digit areas, and Level 3 has 900 three-digit areas. By this pattern, Level M has M-digit areas. This is the number of holes that need to be filled by the squares we can find on the square grid. Notice that if a horizontally-oriented square has area of Level M, then every tilted square in its column has area AT LEAST of Level M. Also, the last column that contains any Level M areas is column where floor is the floor function. In the chart, Column 1 contains 2 areas, and every Column N contains exactly (N+1) areas. The total number of areas represented for Columns 1 through N is an arithmetic sequence, so an upper bound for the number of distinct square areas represented in Columns 1 to N (assuming no duplication, which of course there is) is . maximum area values to fill the Level M area holes. This is an extreme over-estimate as it ignores the fact that this chart also contains all square areas from Level 1 through Level (M-1), and it also contains a few squares which can be determined multiple ways (e.g., area 25 squares). Both of these are dominated by base-10 exponential functions, but the number of areas to be found has a coefficient of 9 and the number of squares that can be found has coefficient 1/2. Further, the number of squares that can be found is decreased by an exponential function of base , accounting in part for the decreasing percentage of found areas noted in the data chart. That is, the number of possible areas grows faster than the number of areas that actually can be created on square grid paper. While this proof does not say WHICH areas are possible (a great source for further questions and investigation! ), it does show that the number of areas of squares impossible to find using a square grid grows without bound. Therefore, there is no largest area possible.